1 It's a cover up! Up until the1960s, when Test and County cricket was played on uncovered pitches, the game was said to be a true test of ability to survive against the elements as well as fast and swing bowling. With the involvement of television (yes, there was television back then) it became more and more important to ensure that the game could go ahead, so the concept of covering up pitches was trialed and introduced. So, what is all the fuss about having to cover a cricket pitch! Maybe it's because the game's governing body, the ECB, see it as the way forward to improve playing surfaces by having the whole pitch covered in order to facilitate some form of cricket. Maybe it's because the game is played on clay, and clubs who do not have covers are left at the mercy of weather during pitch preparation? Either way, covers are now such an integral part of cricket that many clubs use them, even at non-league level. 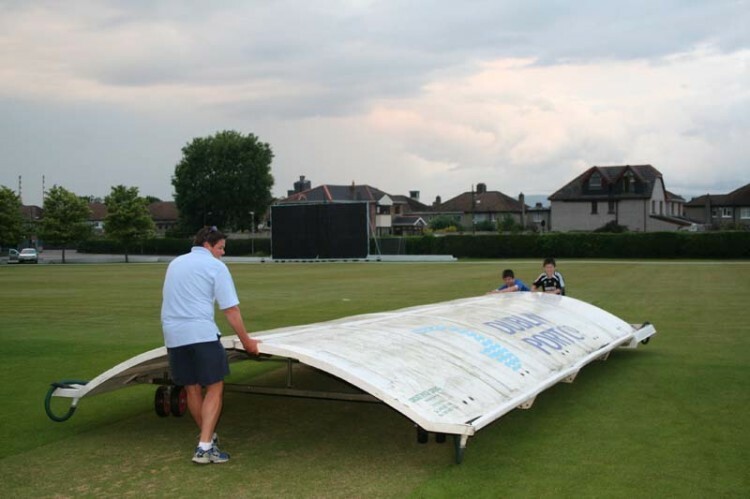 There have been many theories on the use of pitch covers in cricket over the years, and there are some truly 'state of the art' covers at most of the top cricket grounds around the country, none more so than the Stuart Canvas Hover Cover, but that is not the purpose of this article. The most famous (or should that be infamous?) cover was the one used at Edgbaston. It got its nickname "The Birmingham Brumbrella", when it was used to protect the playing surface by means of mechanically rolling out a plastic sheet. It stretched from one side of the ground to the other, across the full length of the cricket table and part of the outfield. At the time it was a very innovative piece of equipment, but had its problems. It was so heavy, and took so long to unroll, that it became impractical. By the time it had completed its journey, the shower that it was supposed to be protecting the surface from, had passed, dumping its load on the way! Eventually, when it broke down during a county game, it was decided to return to the more practical method of covering the entire cricket square and run ups with plastic sheeting and roll on roll off covers (RORO). Which type of covers should you choose? There are two main types of covers - mobile and sheets. Mobile covers are usually apex or half moon shaped. Plastic sheeting generally comes in a four metre width, but can vary in length from 25-40 metres. They can be tailored to meet the requirements of clubs or schools. Mobile covers are not a cheap option. Robust, sturdy and sectional for easier mobility, they are deemed to be more practical than plastic sheeting. They are also seen to be an expensive luxury and a 'status symbol' that many clubs have to have in order to participate in the league. This type of cover can, however, run into £1000s, adding additional financial hardship to clubs just to meet the demands of the regulators of the game. Then there is the maintenance associated with them. Guttering, hoses, tyre repairs and replacement sheeting after being vandalised or damaged by animals and birds; all of which adds to the expense. Plastic sheeting, on the other hand, could be seen as a low cost answer to the problem. At a fraction of the price of ROROs they can still do an adequate job of protecting the playing surface, bowlers' run ups and other parts of the square that mobile covers could not. After all, pitch protection is what we are trying to achieve. Covers are a working tool, just like a heavy roller or the machinery used to prepare the pitch. They play an integral part in producing a quality playing surface for today's game. They have to be conditioned for maximum benefits. Maintenance is just as important as covering the playing surface - a leaking cover serves no purpose at all. The way cricket soils compact can be illustrated by the relationship between moisture content and density. When the soil is dry, adding small amounts of water weakens it. Water is absorbed into the clay particles and they swell. As the soil dries out, the water is removed and the clay particles shrink. Shrinkage due to drying is a very effective way of making pitches denser and harder. The only way to compact soil is by compacting the air. Mineral particles themselves cannot be compacted - neither can water - only air. Covers act to protect the surface during the preparation of a pitch, before scarifying, mowing, rolling, or even during irrigating. The relationship between compaction and pitch performance can be a complex one. Groundsmen need to balance drying for shrinkage, hardness and ball bounce, but must be wary of the affects of service cracking too. 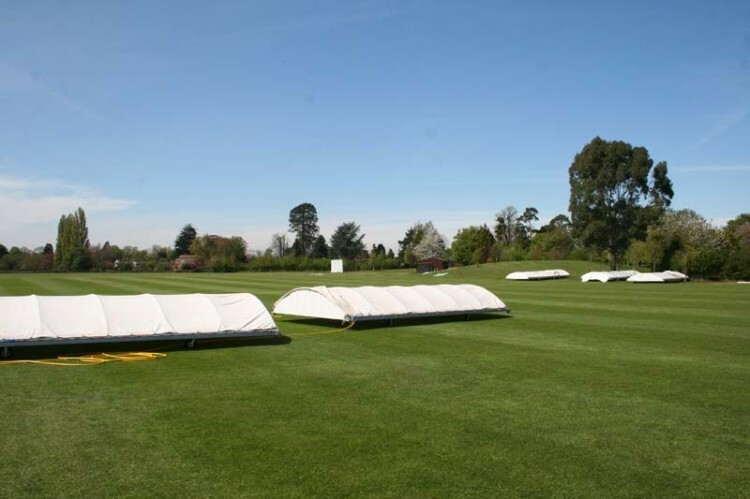 The art of cricket groundsmanship is the skill to balance soil moisture content with pitch playability, and this art is assisted by the availability and use of covers. Utilising them correctly will help the pitch to produce a smoother and more consistent performance. Good preparation ensures that all results are possible. 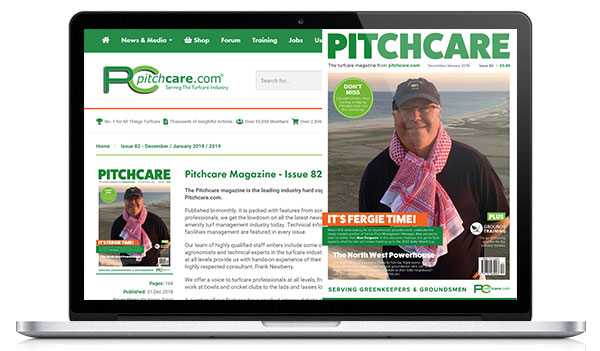 As with over-covering, reduced covering can have negative effects on a pitch. Too dry and the preparation process can be fruitless and may even damage the pitch, which, in turn, can have an affect on the game. 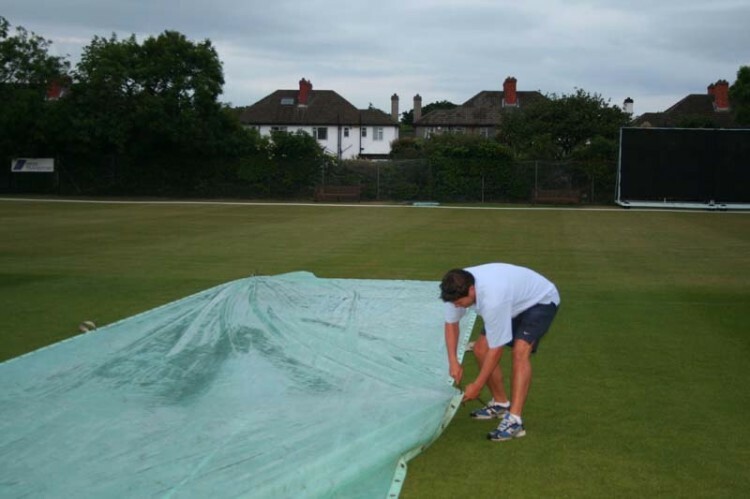 The main aim of covers is to prevent rain from penetrating the surface when the pitch is in play or being prepared. A hard, dry pitch will deform less on ball impact, giving more bounce and pace whilst creating a sustainable surface. There is an optimum moisture content for rolling and covers can be used to control this key element. If the soil is too dry it will be hard and liable to cracking. With too much moisture in the soil the pitch will be too wet to roll. The soils will not consolidate and the air pores will still remain in the profile, producing a dead pitch with little bounce and pace. How often do groundsmen roll in the moisture first thing in the morning during pre-season preparations, or after the covers have been on overnight to achieve consistency? The benefits of covers can be more far reaching than some may realise. Timing, skill and working with Mother Nature all play their part. 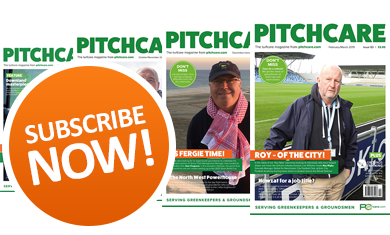 Utilising covers is just one criteria for preparing good, sustainable pitches. If the covers are well looked after, and maintained regularly, they will last a long time. Whilst the concept is to keep the immediate playing surface dry during showers or longer periods of rain, they can also be adapted to assisting in the preparation of pitches during drought conditions. For example, irrigating or damping down a pitch the night before a game, then covering it, will retain the moisture for the following day, reducing overnight transpiration and enabling the production of a better pitch. In the event that a club has not invested in germination sheets, they can even become cloches to encourage germination of the grass seed following renovation of a used pitch. 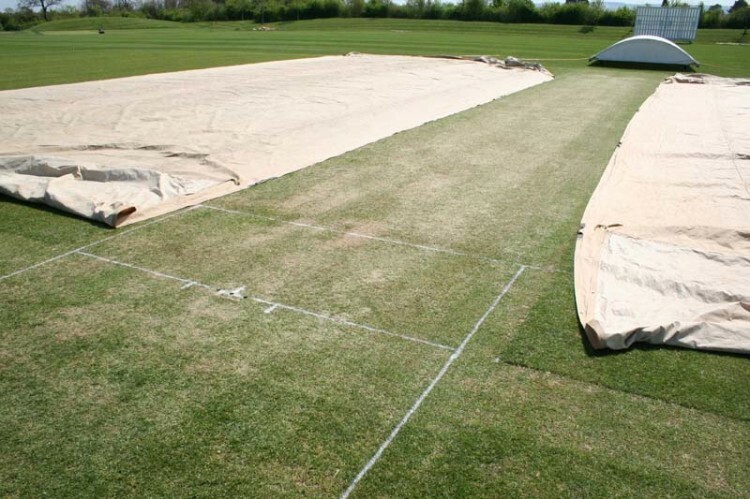 Just because it is dry does not mean that the covers should be stuck in the corner of the ground somewhere when they could be put to good use. After all, they have cost the club a lot of money and the players will appreciate it in the long term. Whilst covers can prevent the intrusion of pests such as birds searching for leatherjackets, chafer grubs, grass seed and worms, they can also cause stress of the grasses, harbour disease and weaken the sward. Covers can create a climatic condition, or sweating, when left on too long. They will encourage Fusarium patch disease, (Microdochium nivale), small brown / orange like water soaked circles where sparse white or pink mycelium can be found around the edges of each patch. This causes disfiguring and damage to the turf, and stressing out of the grasses. Leaving covers on too long also weakens the sward by bolting the grass, leaving it looking leggy and long. This will have an effect on preparation, performance, wear and tear and, subsequently, recovery of the grass after the pitch has been used for its final game. On a point of Health & Safety, how many clubs or schools consider this when using a set of homemade covers? Those gallant volunteers, players or staff members who rush on and struggle with the covers in the middle of a downpour, only to do the same thing again when it stops, without considering the consequences of tripping or slipping. 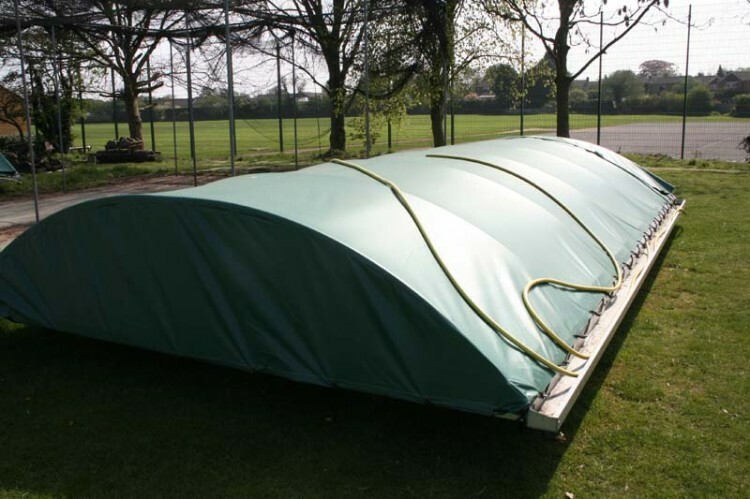 Guidelines on the safe handling and use of covers need to be considered, so that clubs can be fully aware of any consequences associated with their use. How much can you afford ? What type of covers are most effective for your needs? If mobile RORO, should they be manufactured or 'home made'? Plastic sheeting - lightweight or heavy duty? Would a tarpaulin suffice? 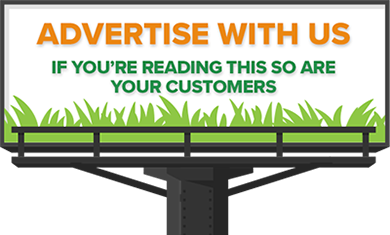 Will you be getting value for money out of purchasing an expensive set of covers? Will the covers be put to good use, or are they just a status symbol? How do covers work and can they provide a better playing surface? 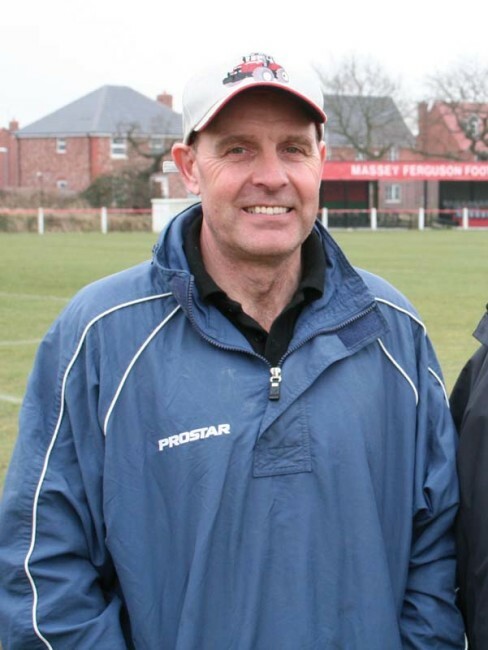 Can the covers be managed better to help promote better playing facilities? Which pitches get covered and who makes that decision? What guidelines are there in the use of covers? Are they insured and what is the cost? How do clubs' purchase - cash, hire purchase etc.? Are there any funding opportunities - ECB, Local Authorities, Lottery etc.? Maintenance - who carries out repairs and what will the annual cost be? Where are replacement parts sourced from? Some would say that state of the art mobile covers are a luxury item, and that the game is becoming "two tiered". Perhaps, if you are working at a high profile sportsground or stadia, with all the available resources, you may consider covers to be an essential piece of kit, whereas there are some clubs who simply feel they are luxuries they cannot afford. However, even at grassroots level, clubs who have spent all their hard earned cash on purchasing a set of ROROs would probably disagree. 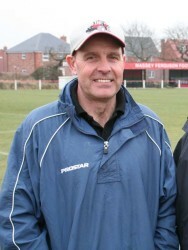 Covers are a vital tool in the success of a club. Every penny spent getting a game started and, ultimately, completed is well worth the effort, with the bar revenue alone providing a valuable income stream. But, what about those clubs who simply cannot afford to purchase a set of state of the art covers, yet are still compelled to provide some form of pitch protection or covering under the rules governing their league? Some may decide to make their own, buy second hand or restore. Either way, money still has to be found. Others may opt for plastic sheeting to protect their pitches, only to find it has been blown away, stolen or destroyed by mindless hooligans who get a kick out of someone else's misfortune. Failure to comply may see the club demoted to the lower echelons of the cricketing pyramid. Clubs may even decide to revert back to just playing social cricket on a Sunday where covers are not a necessity. Where does it end? I firmly believe that the ECB and County Cricket Boards should be seen to be more proactive in developing and assisting local clubs and leagues with funding for this much needed resource, if only to keep the spirit of the game alive.